Before Shockabilly, before the Downtown New York scene, there was a guy in Alberta playing very strange things on an acoustic guitar. This disc is a reissue of the classic and long out-of-print second solo LP by legendary guitar madman Eugene Chadbourne. Beautifully recorded, and mastered directly from the master tapes, Volume 2 is an essential document of Chadbourne's innovative prepared guitar playing. This reissue also includes three previously unreleased tracks from the same period (ca. 1976). 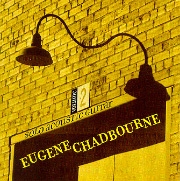 Volume 2: Solo Acoustic Guitar is a unique document of the new directions in guitar playing that Chadbourne helped pioneer in the US. Notes from the original release (an excerpt) "This is a recording of solo guitar music. The pieces are heard basically as they were played in real time, with no overdubbing. A total of four notes were eliminated due to problems with immigration. 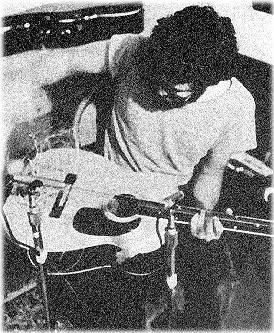 There are several sounds on this recording which the performer had nothing to do with..."
"Eugene Chadbourne uses cheap, battered Harmony Guitars from pawnshops exclusively, but stay tuned for further developments." Mao Tse Tung Did Not Have To Deal With People Who Were Watching Seven Hours Of Television Every Day. Oh, and the CD booklet folds out into a nice sepia-toned poster of the "guitar tree." Perfect for the dorm room or basement.